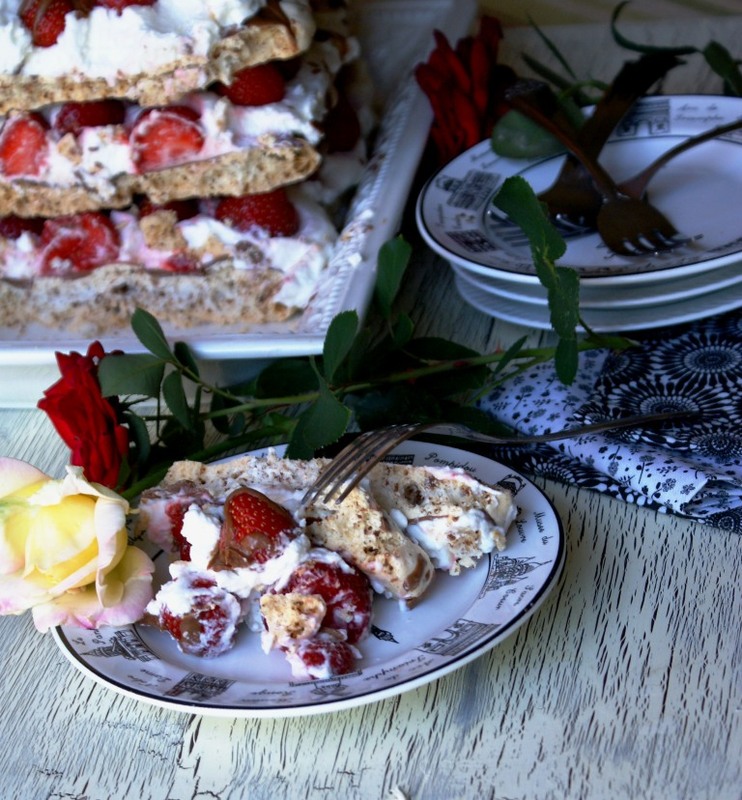 I wanted to make this Pavlova since I discovered it last year on a French website. This is the second item to cross off my 2013 (baking) To Do List . The first item was Bourke Street Bakery croissants, which were a-m-a-z-i-n-g, but I still didn’t find time to post about them (that’s still coming). The original recipe actually calls for raspberries and dark chocolate. I changed the quantity of some ingredients and also used what I had in the house, which were some sweet Michigan strawberries and milk chocolate. I didn’t regret it because it was a huge hit with my family, so I am perfectly happy. 🙂 This is such a great summer dessert! I hope you will be making it soon. Happy SUMMER! 1. Draw 3 rectangles of 10 X 30 cm (4 X 12 inches) on sheets of parchment paper and place on two baking sheets. In a bowl, beat the egg whites until stiff, then gradually add half of sugar while beating . The mixture should be very firm and look shine. 2. 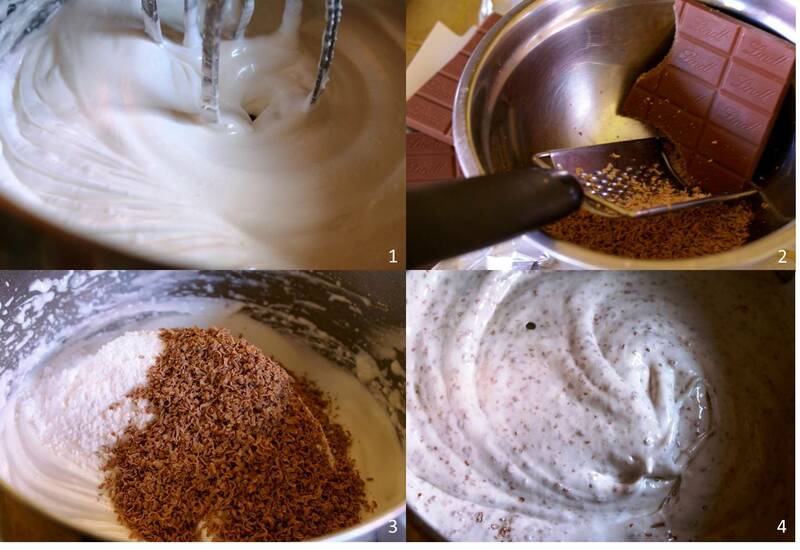 Using a spoon or spatula, gently fold in the remaining sugar, cornstarch and grated chocolate. 3. Place the prepared meringue into a piping bag fitted with a 1 cm star tip. 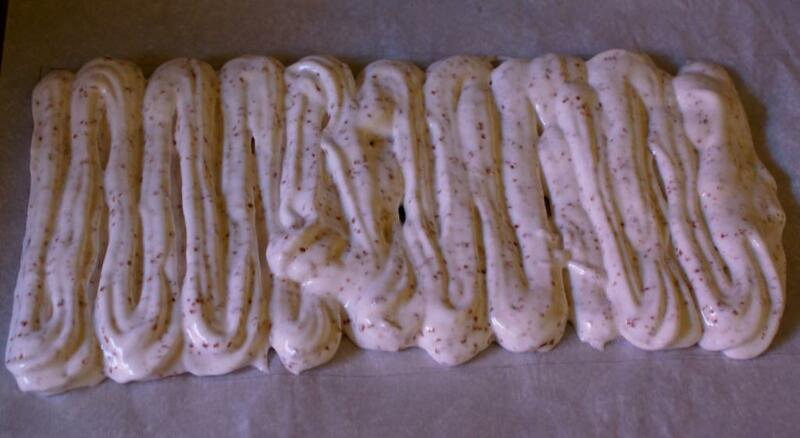 Fill the rectangles drawn by drawing lines with the meringue. Bake in preheated oven at 100° C (about 200 F) for 1 hour. Without opening the door, turn off the oven and leave the meringues cool inside. Then take off from the paper. 4. 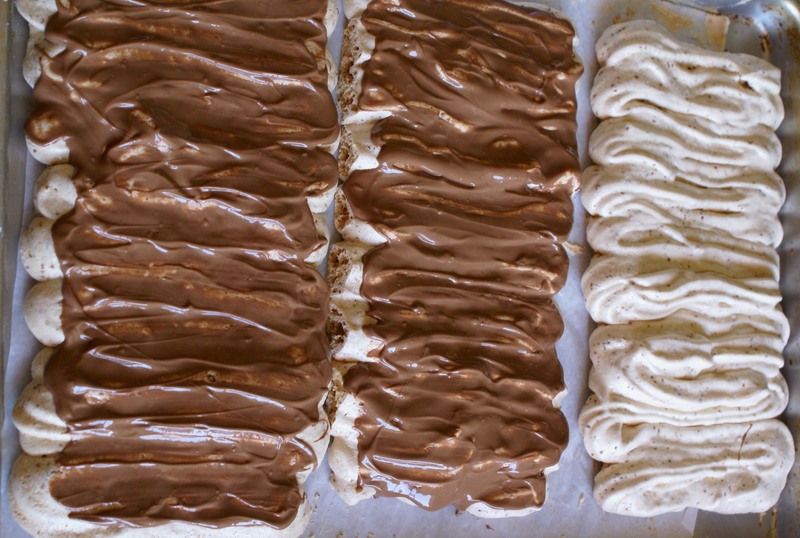 To make the filling, melt the chocolate and spread it over two meringues. Allow to harden. 5. 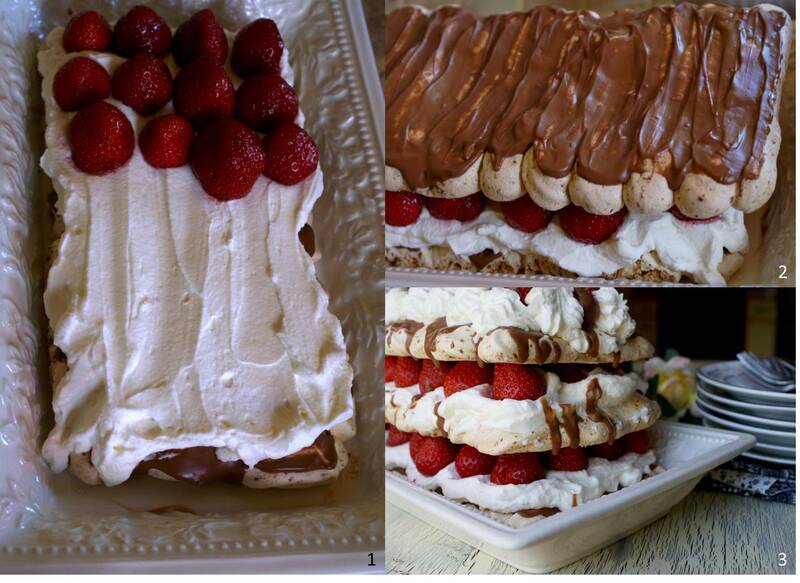 Place one of two chocolate meringues on a plate and cover with about 1/3 of the whipped cream and strawberries. 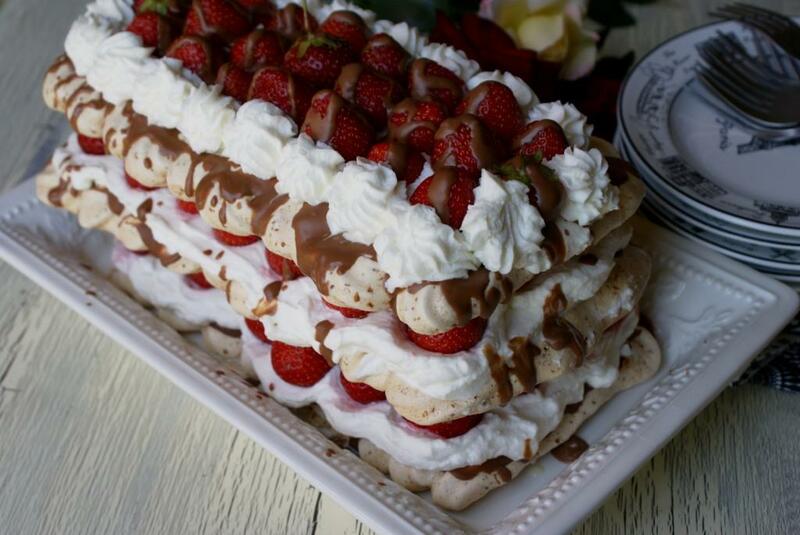 Gently place the second meringue chocolate on top and cover with half the cream and the remaining strawberries. 6. Finally, place the last meringue on top and decorate with the remaining cream and strawberries. Drizzle melted chocolate over the top and serve. As always, gorgeous images of gorgeous baked goods. I don’t know why your family members don’t weigh a thousand pounds each. Have a great summer. Oh my – that is BEAUTIFUL. Almost too beautiful to eat but I wouldn’t let that stop me! Oh Sibella, that looks amazing! Better than the original, I’d say. 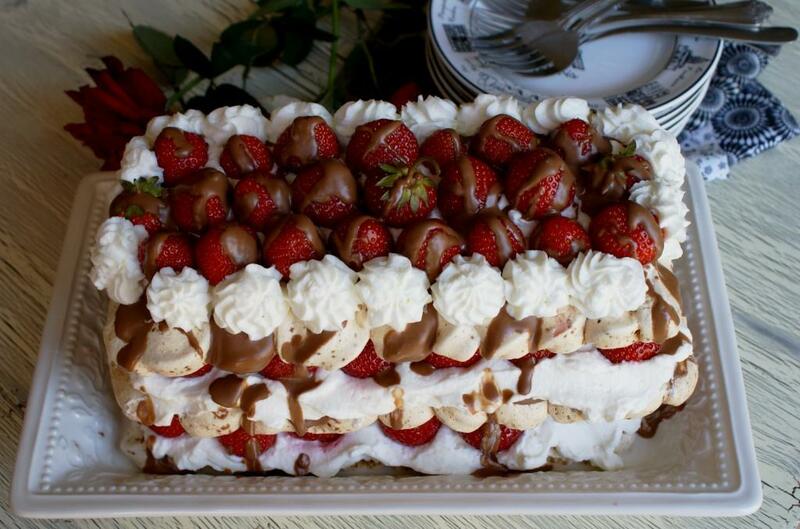 Pavlova is definitely on my list as well (or is it? Lol, I should go make sure it is 😉 ). Love your new blog header! You should be proud – it looks really professional! You’re like a professional bakery, wow! Sibella, I thought for sure this beautiful dessert would be so complicated to prepare, but your instructions and your photos have simplified everything. This is one of the prettiest pavlovas that I have ever seen. This is BEAUTIFUL, Sibella. I love strawberries. Nice job! BTW, When I had my bakery, it was a joy! I miss it daily. That is one beautiful pavlova! wow it looks so lovely ! Love how you out placed the layers….. Felt so tempting to me ! Love the recipe And the looks of the dish !